The Menagerie currently resides on 20+ acres in northern California, acres of rolling hills covered by lush grasses, with a number of oak and pine trees providing shade and habitat. An ephemeral creek highlights the beautiful topography, and the variety of birds is incredible. Magical Menagerie's stewards are David and Linda Lee-Johnson, and their daughters, Patricia and Alicia. The Menagerie has its beginnings in the late 80s when Linda dreamed of owning her own llama. She worked and saved, and soon she had one - and then another, and another. It wasn't too long afterwards that the prizes and honors began accumulating as Dave and Linda began showing their llamas at state fairs and other llama shows. In the mid-90s Dave brought home an angora goat, a gift for Linda. Snow Queen was the beginning of a dynasty that continues to this day. Her children continue to give birth to award-winning goats, with award-winning fleeces. The late 90s saw the Menagerie being a part of the pioneering effort to revive the importance of the colored angora goat. The latest breed to join the Menagerie is border collies. So far borders are looking to be as fun and successful as everything else the menagerie has turned its attention to. Is there a secret? Only that they truly love what they do, and really care for their charges. Linda and Dave take extra time to pay attention to the animals, to make sure they are well-fed, healthy, and content. Each breeding decision is weighed and thoroughly discussed before being committed to. 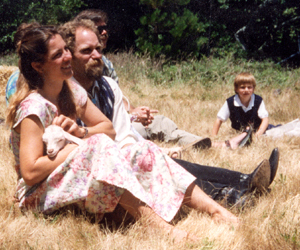 David and Linda see the animals as their spiritual partners and family, a feeling the animals seem to share. And the results are plain to see. Whether at the Black Sheep Gathering in Oregon, the California State Fair, the LANA Expo, or any other venue where the Magical Menagerie displays its herd, they are sure to take home top honors.